Where do architecture, sustainability, light and music converge? At Kubik, a very hip, greenly-designed nightclub currently located in Barcelona. 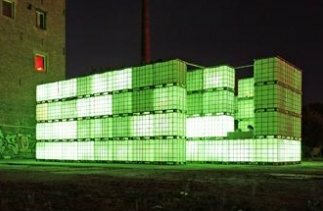 Kubik is a temporary open-air installation linking architecture, light and music with a contemporary air of reclaimed material usage. A radically different nightclub, the space is open to the sky and besides the sea, the structure built from hundreds of reclaimed, stacked, and illuminated industrial tanks. Founded and first installed in Berlin, Kubik now settles for the limited time of four months from June 13th until September 29th at the Fòrum Barcelona. Two-hundred seventy-five illuminated industrial tanks *) are piled one on top of each other, building a spectacular designed object of walls and columns. Inside Kubik, visitors experience illuminated cubes, whose light geometry constantly changes to the rhythm of music. Quotation from Mordern & Contemporary Design Magazine: Iluminated cubes, visual games, electronic beats: these are the three elements of Berlin’s new open air club Kubik which opened at the beginning of July. From quite a distance you can see the illuminated Kubik which is located at a factory ruin near the Berlin river Spree. The installation is based on the so called concept ’big tanks’ invented by modulorbeat, a team of three young architects and urbanists in Münster: modulorbeat used dozens of conventional 1000-litre water tanks to create a temporary installation. However, the intention was to design an installation that provides both the room with an architectural structure and the possibility to fill each tank with an illuminant (bulbs). On the one hand the 160 plastic water tanks illume for all the visitors, on the other hand they serve another purpose: At weekends when dusk is falling different VJs will use the room of the architectural structure and play with it visually by “programming“ the tanks due to a complex controlling and timing for which special control units (e-cue) were installed by the company Lightlife, Cologne. The electric bulbs inside the tanks are individually controllable and can be used just like an oversized low-tech screen *).